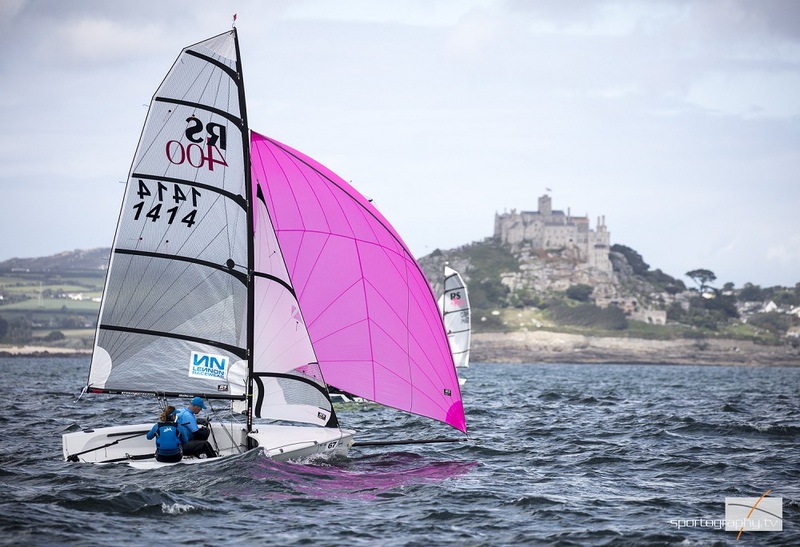 When Mounts Bay Sailing Club, in Marazion, Cornwall was announced as the venue for this year’s Volvo Noble Marine RS400 National Championships the fleet needed little encouragement to sign up as 74 boats took to the cause. 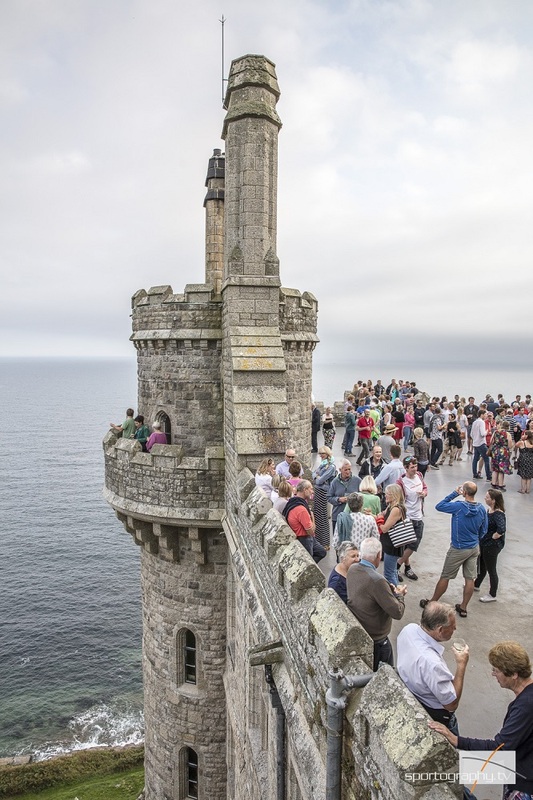 Overlooked by the impressive St Michael’s Mount, the venue is well known for its ability to deliver a wide variety of conditions from strong winds and big waves, to light conditions and flat waters with subtly tricky tidal currents. This year’s event encompassed all of these conditions in pretty much every combination throughout the five day championship. As if to justify its reputation for being a venue for grown ups, the weather delivered rain, strong winds and a large swell for the opening race. And while the breeze moderated for the second race of the day, the fleet was left in now doubt that Mounts Bay meant business. The pecking order in the fleet was less clear with three boats leading on equal points. Day two saw conditions shift gear completely. Gone was the large swell and stiff breeze to be replaced by flat water and 6-8 knots of wind. After a further two races the focus of attention in the fleet now included Stewart and Sarah Robertson, Dave Exley and Mark Lunn, Alex Barry and Richard Leonard along with Paul and Mark Oakey who had each scored top three results to put pressure on Goringe and Wells. In its effort to keep the fleet on its toes, the weather threw 15-18 knots, sunshine and waves into the mix while the local wildlife sent a pod of dolphins and flock of sea birds to liven things up still further. For many, this was the outstanding day of the week with some of the best racing conditions of the season. Once again Goringe and Wells were the stand out performers of the day delivering two back to back wins to extend their lead in the overall series. But another team was making its mark at the front of the fleet, namely John Downey and Sandy Rimmington sailing 522. Finishing10th in the first race was an impressive performance for an old boat in a highly competitive fleet. Finishing 4th in the second race proved that their performance had been no fluke. The penultimate day proved to be a waiting game as the light breeze danced around the bay as if playing hide and seek with the race committee who were trying to lay a fair course. When racing did get under way conditions were light and tricky with a difficult sea state on hand to stop all who weren’t concentrating in their tracks. Once again was Jon Gorringe and Oli Wells who led the fleet with Francisco and Teresa Lobato and last year’s National champions Paul and Mark Oakey close behind. 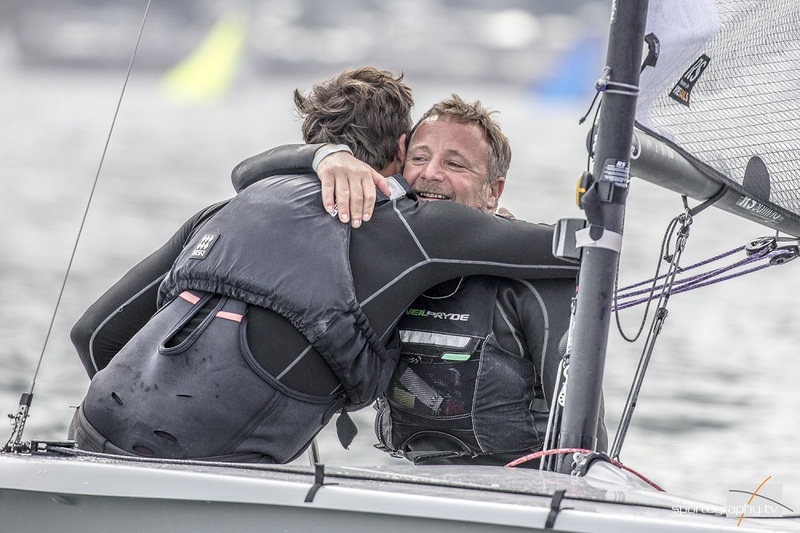 When it came to the final day’s racing and the battle for the biggest of the silverware Gorringe and Wells were in a strong position but still had to fend off the advances of the Portuguese Lobato pair who were still close enough on points to take the overall win. With light and shifty conditions prevailing it was perhaps unsurprising that the pair locked horns with some match racing in the busy pre-start, chasing each other around the fleet like children at a family party. Throughout the day the conditions became increasingly light and shifty putting added pressure on Gorringe and Wells as they fought hard to avoid being caught up in the large dead patches of water. A giant hole had opened up in the middle of the course to trap the bulk of the fleet but the usual suspects had seen the breeze heading in from the distance and had got themselves into this to sail around the outside of the windless zone. Minutes later Goringe and Wells had taken another win with the Oakeys in second and the Lobatos in third. The impressive final performance had sealed the overall victory for Goringe and Wells while the Lobatos took second and Paul Hilliar and Matt Bailey finished third. 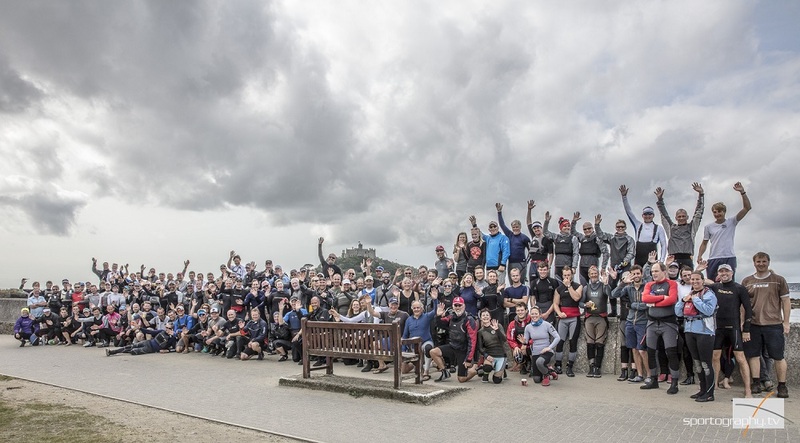 The battles continued down the fleet throughout the championship, with Rob Jones and Robin Russell (in 22nd) taking the Silver Fleet Trophy, and Ben Pickering and Dom Mortimer (in 33rd overall) taking the Bronze title. New-comer Chloe Martin took the Lady Helm trophy, coming in 15th sailing with brother Dan. 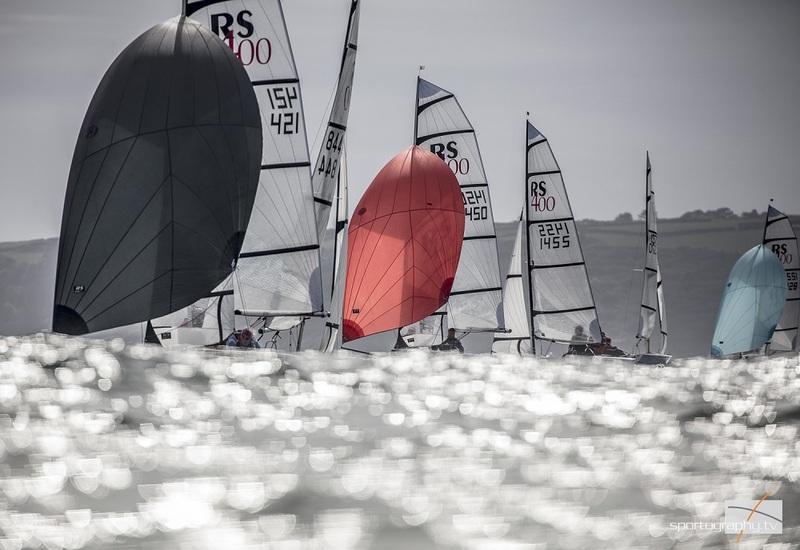 In the new 4-Nations Cup, the Irish were the winners and will have to come in number to the RS400 Europeans at the RS Games to defend their title. RS Sailing donated a spinnaker and jib to the fleet in honour of the great turnout and these were raffled under strict terms at the final championships, with Paul Hilliar winning the spinnaker and Nick Daniels the jib. Congratulations to all the champions, and a massive thank you to Mounts Bay SC, the sponsors Volvo UK and Noble Marine Insurance, and to supporters Harken UK, Forwards Sailing and RS Sailing.